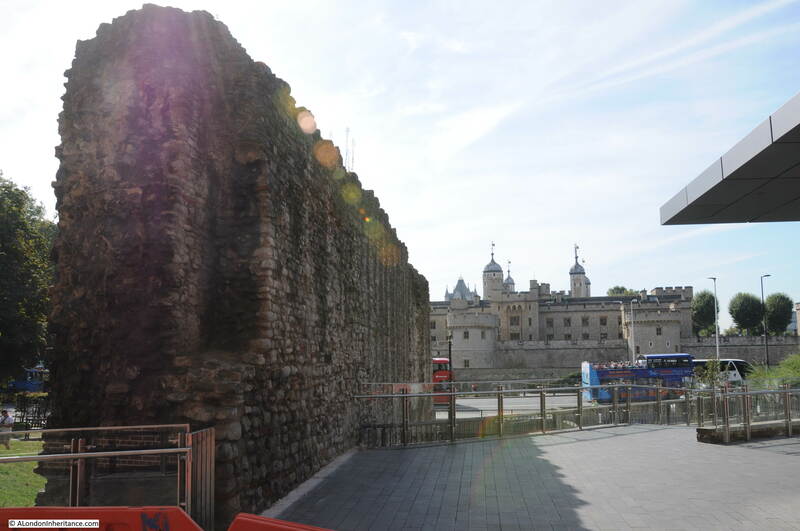 Tower Hill is one of the best places to see remnants from London’s early history. A couple of weeks ago I featured the church of All Hallows by the Tower with the Saxon arch and Roman floor, this week it is the turn of the Roman Wall on Tower Hill. This is my father’s photo from 1947 showing a length of Roman wall on Tower Hill. 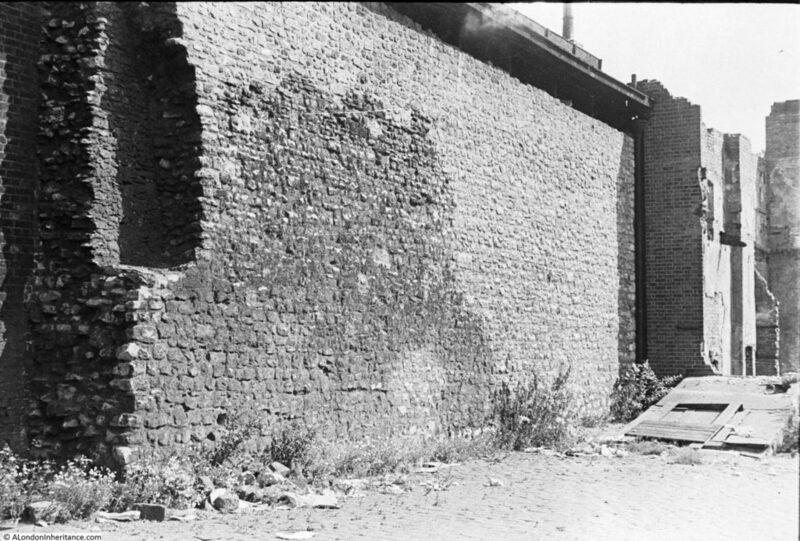 It was easy to locate this length of wall, the cut out section at the end of the wall is a clear marker of which side of the wall is the subject of the photo. My father took the photo in the afternoon as the sun was shining directly onto the wall. When I visited, I made the mistake of being there in the morning when the sun was just over the eastern edge of the wall and caused problems trying to get the same photo, so I took the following slightly edge on, still with some impact from the sun, however it clearly shows the same cut out section and has the benefit of positioning the location of the wall by showing the Tower of London in the background. Today, this length of wall stands in isolation, however this area of Tower Hill was once full of buildings and as can be seen from my father’s photo there is a building at the end of the wall and parts of the roof of a building on the other side of the wall can just be seen. The wall today is just outside Tower Hill Station, however in 1947 the station did not exist. An earlier Tower Hill Station had closed in 1884 and Mark Lane Station (located opposite All Hallows by the Tower) had served the area. Mark Lane Station (more on this in a future post) closed in 1967 when the present Tower Hill Station opened. The following extract from the 1940 Bartholomew’s Atlas of Greater London shows the route of the underground (the black and white line) with Mark Lane Station clearly marked in the centre of the map opposite the church, and no mention of Tower Hill Station, as it did not exist at this time. One of my books on London is a little publication with the title “London Wall Through Eighteen Centuries”. Published in 1937 for the Council for Tower Hill Improvement, the book is a detailed history and survey of the London Wall with articles on the history of the wall in Roman, Medieval, Tudor and later times, and a detailed guide of where to find the wall (one of my many future projects is to use this book as a guide to walking the wall today to see how the wall, its visibility, condition and the route has changed since 1937). One of the photos in the book is the same section of the wall as my father photographed with the same cut out section at the end of the wall and the same markings on the wall. I will have to return one afternoon and get a better photo with the sun in the right position. 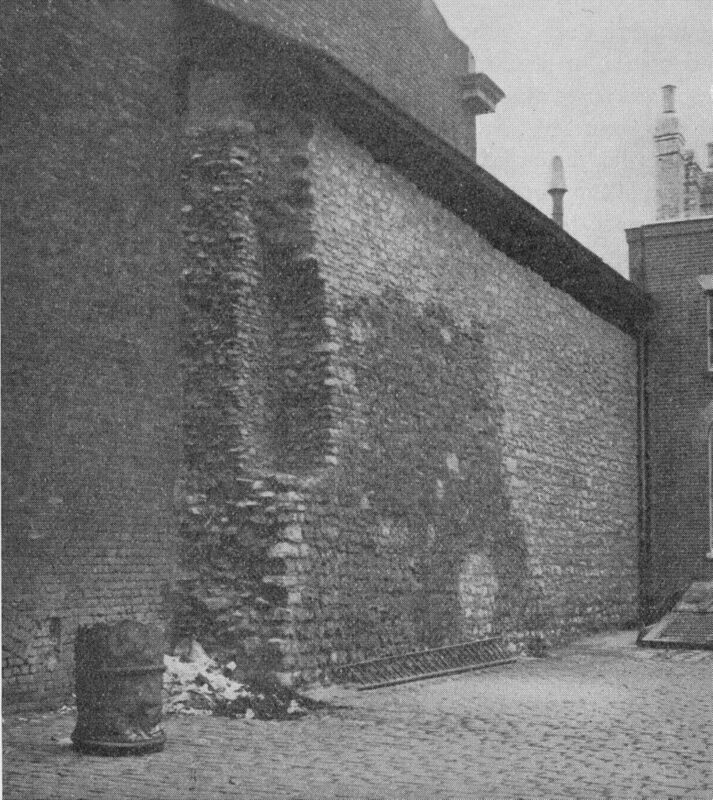 The photo shows how the wall was part of the surrounding buildings – very different to today. My father also photographed parts of a Roman tombstone which had been found on Tower Hill. Two parts of the tombstone were found, with the first top section in 1852 and the lower section during construction of an electricity substation at Tower Hill in 1935. The following photo shows these parts, which I believe are the originals inserted in a surrounding stone with the missing lettering added to the smooth stone on the top block. The words Dis Manibvs confirm this to be a tombstone as they mean “to the shades of the dead”. The middle section is missing, however the tombstone appears to be to Gaius Julius Alpinus Classicianus, the procurator of the province of Britain after Boudica’s revolt, so very early in the Roman occupation of Britain. The tombstone was set up by his wife, Julia Pacata Indiana. If the stones in my father’s photo are the originals, I believe they have since been moved to the British Museum and today a modern replica exists at Tower Hill. I have not had time to check, but if you know if the originals are at the British Museum, or another location I would be interested to know. There is a small park area on the opposite side of the wall, this was occupied by buildings in the earlier photos above. There is another large section of wall on Tower Hill, although not so visible. This sections runs further back from the above section between offices on the right and the CitizenM hotel on the left. I assume that this part of the wall needed to be destroyed due to the cut and cover technique of building this section of the underground. “It is built into Barber’s Bonded Warehouses, which you enter from Cooper’s Row, Trinity Square – or, more truthfully, I might say this part of the wide-spreading vaults and floors is added to the old City Wall. Long ago, when Barber’s premises were about to rise under scaffolding, the builder found the City Wall there standing, and I picture him gazing at it, lost in thought, in puzzling wonder what he should do. To destroy it with pickaxe and shovel would be a herculean and costly task. It is immensely thick, and hard as iron. 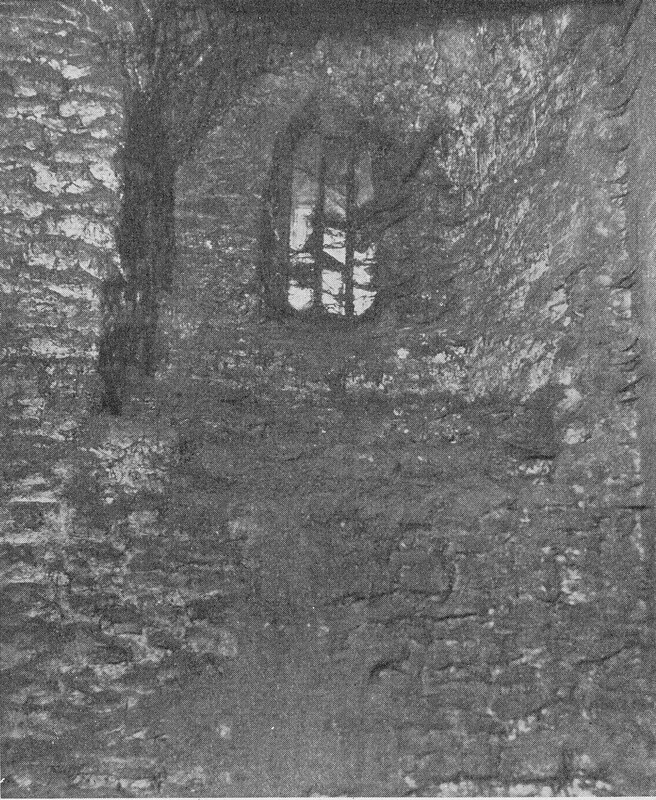 How long ago that was I cannot tell, but the partner of Messrs. Joseph Barber & Co. who showed me the wall, with lamp held at the end of a lath and lighted that I might explore its intricacies, mentioned to me his great-grandfather as having been a member of the firm owning these vaults. These paragraphs by Walter G. Bell tell us so much about how London’s wall has survived and the attitude to the wall. Those sections that still remain are there because they could serve some purpose over the centuries. They are there as they could provide a wall without the need to build a new one, they are there as sometimes they would have cost more to destroy. Written in 1937, it was only then that the historic value of the wall was starting to be considered. It is the Barbour’s Warehouse Buildings that be seen in my father’s photo and the photo from the book with the roof above the Roman Wall and at the end of the wall. There is one final intriguing photo in the book on the wall at Tower Hill. The following photo is captioned “A medieval window in the Wall in Barbour’s Warehouse, Cooper’s Row, Tower Hill, November 1936”. 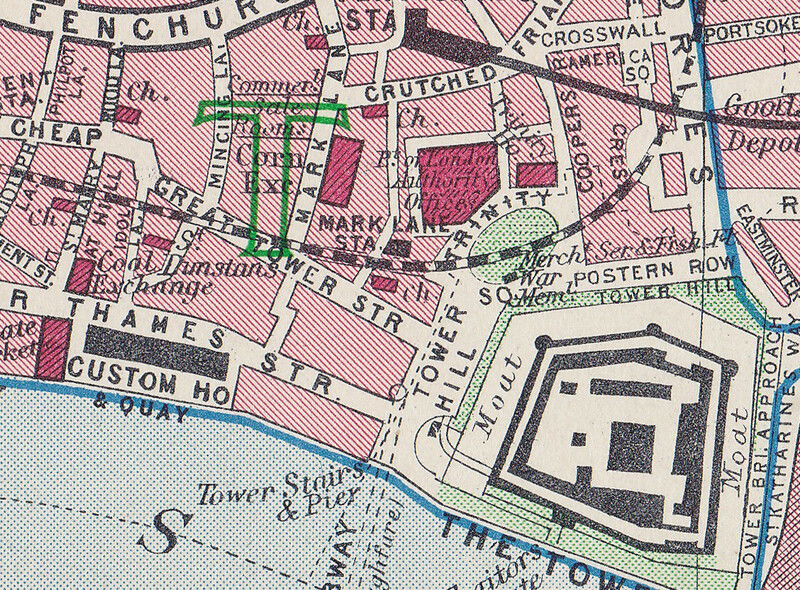 Coopers Row is shown in the 1940 map above, to the right of Trinity Square. I believe this may be in the section running back past the CitizenM hotel, but I could not get close enough to check, but again it demonstrates how the wall has been incorporated in other buildings over the centuries. 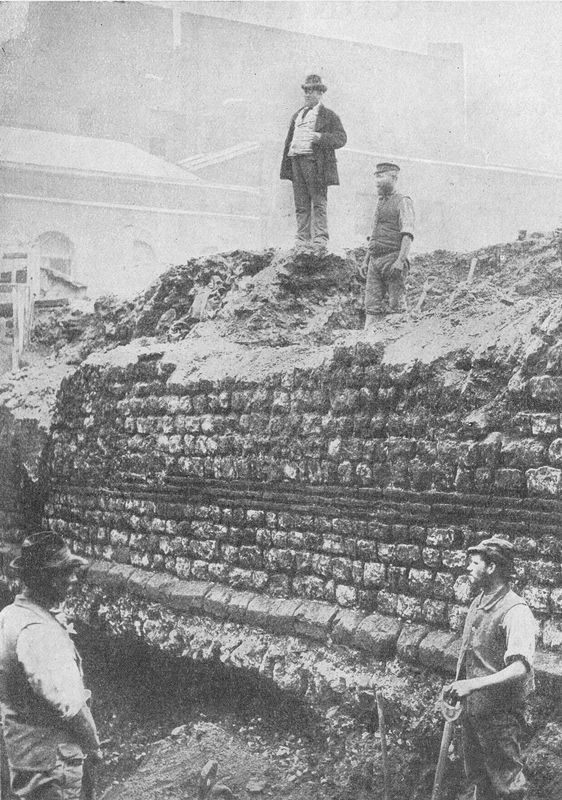 The book “London Wall Through Eighteen Centuries” provided a complete survey of the wall as it was in 1937, just as the importance of preserving antiquities such as the wall was starting to be understood. Hopefully, one day I will get the time to explore the full length of the London Wall using the 1937 book as my guide, but until then I will try and get back to Tower Hill and take a better photo with the right lighting of this lovely remaining section, now standing free of Barber’s Bonded Warehouses. This entry was posted in London Monuments and tagged London Wall, Roman Wall, Tower Hill on October 16, 2016 by admin. Yes, the tombstone for Gaius Julius Alpinus Classicianus is, as you conjectured, at the British Museum: http://www.britishmuseum.org/research/collection_online/collection_object_details.aspx?assetId=33585001&objectId=1362944&partId=1 . Worth a look since it shows the whole monument, reconstructed. When you explore the whole London Wall do collect those nice white and pale blue tiled history plaques, which date from the 80s. Some are now lost or damaged but they were a superior type of heritage signage. Reconstructed stone tomb of Gaius Julius Alpinus Classicianus. To the spirits of the departed (and) of Gaius Julius Alpinus Classicianus, son of Gaius, of the Fabian voting tribe, …procurator of the province of Britain; Julia Pacata I[ndiana], daughter of Indus, his wife, had this built. Curator’s commentsIncorporating 1852,0806.1 & 1935,0712.1.For a full commentary on the tombstone see Grasby, R.D. & Tomlin, R.S.O., 2002. 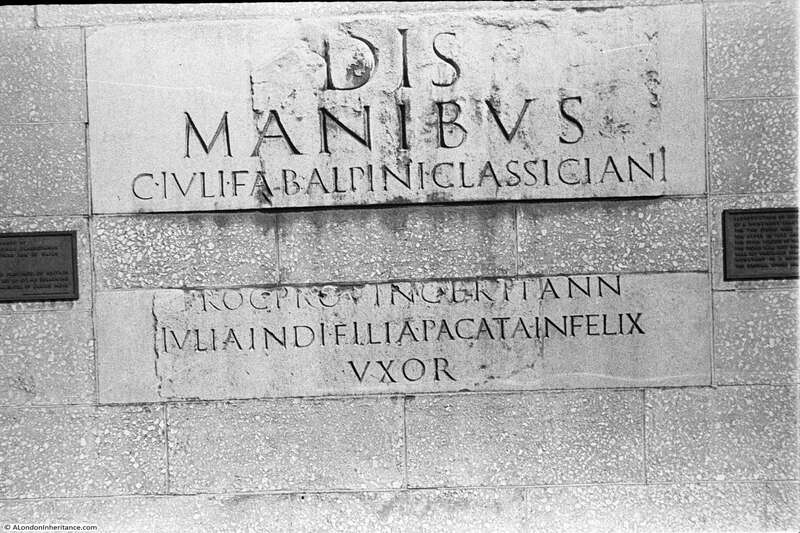 ‘The Sepulchral monument of the Procurator C. Julius Classicianus’, Britannia 33 (2002), 41-75.This is the reconstructed tombstone of Gaius Julius Alpinus Classicianus. His name shows him to have been a member of the Gallic aristocracy, but we know more about him from the Roman historian Tacitus, an unusual instance where we can link a documented person to a burial monument. Nero (reigned AD 54-68) appointed Classsicianus as the procurator (finance minister) of Britain after the revolt of the Iceni led by Queen Boudica in AD 60-61. His job was to correct the financial abuses that had been an important cause of the rebellion.In late Roman times (fourth century AD), pieces of the tombstone were re-used in the hurried construction of one of the bastions that protected the walls of Roman London. The first surviving pieces came to light in 1852; further sections were discovered in 1885, when an underground railway was cut through the site, and in 1935. This was one of the first galleries at the BM which I helped to create! Funny to think I walk past both this tombstone and the place where it was discovered almost daily. Thanks Tim – compared the photo in your link with my father’s photo and it does appear to be the same. I was surprised that even in the 1940s and with the wartime bombing a few years before that such an important tombstone would be out in the open. I do not know if when my father took the photo it had just been installed after possible safe keeping somewhere else during the war. As is readily apparent from the BM photos, and barely noticeable in your father’s one where the texture of the surface changes, only parts of the inscription remain – top right and bottom left. The M of “MANIBVS” was reconstructed, as is the word “INFELIX”, based on the initial letter I, but now reconstructed as “?INDIANA”. I wonder – were the surrounding buildings removed after suffering bomb damage in the war? I devoured this. Thank you. I assume the 1937 book is out of print? I would enjoy reading about your project! Please start it soon! Thanks for this detailed post. I have a longstanding and continuing interest in the Roman wall. At least a few of the blue and white tile signs from the 1980s do survive: for example, there is one on St. Martin le Grand, on the east side of the street just south of the Museum of London roundabout. I believe the Museum of London previously had a self-guided walking tour of the wall, but I understand it’s no longer easily available. Perhaps the MoL would be able to find a copy for your project. As for the section of the wall near CitizenM, if I have my bearings straight it is easily accessible through the carpark of the Grange Hotel, just to the north on Cooper’s Row. I just walked through with no problem. (Don’t be shy: there is a pedestrian walkway, and you can walk around to see both sides of the wall. )I have a lovely picture from April 2016, but can’t figure out any way to post it in the comments. You can clearly see two window openings in that section of the wall. Thanks Alison, I looked over the edge but the area below seemed to be part of the CitizenM hotel. I will take a look round next time and try the route you suggest. Would be good to get up close to the wall. Very interesting article. I recently saw a section of the wall on a guided walk with the Museum of London. Great post! I also own a copy of ‘London Wall through eighteen centuries’ and although it’s long out-of-print there are a couple of copies on abebooks for about £20. There have been some archaeological developments since then and the date of the Wall has inched a little lower to c. 200. There are even some recent developments which suggest an even lower date of c. 190 but the jury’s still out on those. One tiny mystery is why the Wall was built at all. Obviously it was for defence but London was rebuilt after the Boudiccan revolt of 60/61 and functioned without a wall for well over a hundred years. The transition of London to a colonia seems to have happened much later in the 4th century. Perhaps it was built just to keep the soldiers stationed at Cripplegate Fort out of mischief. The Wall was certainly never needed during the Roman occupation. There are several stretches of Wall remaining near the Barbican including some bastions – although these were much later additions. Sadly the best preserved one, at the North-West corner of the wall is not accessible to the public (although you can overlook it from a walkway) but you can examine the ones immediately to its South. Thanks Matt – it is a great little book and whilst new evidence changes the view of aspects such as the date of the wall, I find books such as this one interesting for how things were viewed at the time. The north-west corner section, is that the one along Noble Street? That stretch has always interested me as there seems to be many other parts of buildings integrated within the original wall. Evidence of later building and how the wall has been used over the centuries. The Wall remains in Noble Street continue northwards, across London Wall, and into the Barbican, just adjacent to the Museum of London on the west and the Barber-Surgeons Hall on the east. The zig-zag around Aldersgate is due to the fact that an existing Roman fort at Cripplegate was incorporated into the Wall. 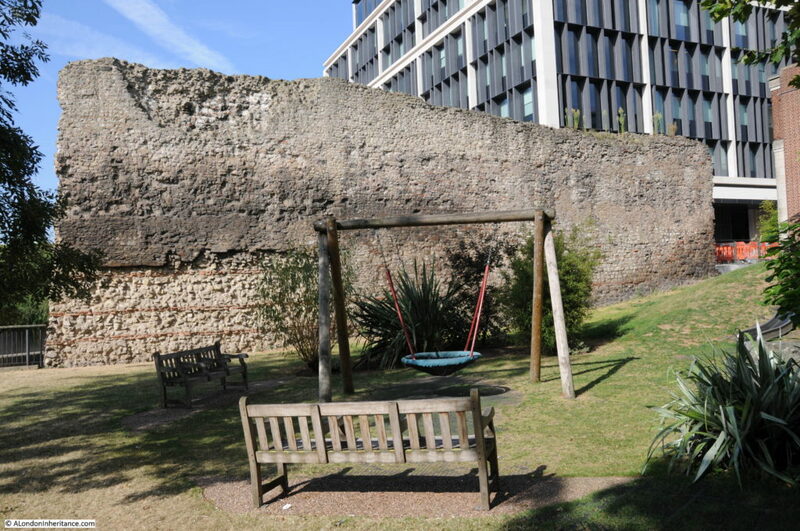 The discovery of the fort by Professor Grimes was only made possible by the extensive bombing that Cripplegate suffered during WW2 – obviously too late for “London Wall Through Eighteen Centuries”. Large free-standing Roman walls always look incongruous. The one at Wroxeter was always a puzzle to me (the biggest in England) until I found out that it had formed part of a medieval barn. I’m not sure that it’s best to clear the accretions – ancient walls are somehow more coherent when they are absorbed by the urban fabric. The amphitheatre in Bordeaux is a good example – the full circle is almost intact but at least three quarters of it is absorbed into the 19th century buildings which is very noticeable from aerial photos. A more remarkable example was the discovery of the Roman baths in a town called Entrammes in 1987. They were found to be standing to a height of twenty feet! Nobody knew they were their until they decided to renovate the church! Perhaps we are a bit too puritan in our conservation. 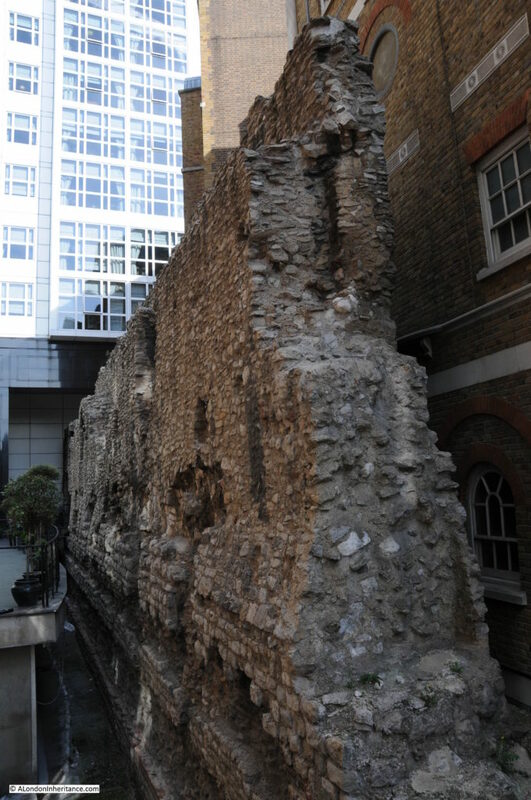 Good to see that the London Wall was used for so many centuries. Loved this blog! Thanks for the feedback Peter. As with Wroxeter and many parts of the wall in London, I suspect they only survived as they could serve a useful purpose. There did not seem to be much interest in preservation in past centuries, understandable given the challenges of daily life. As Alison notes above, I can confirm you should have no problem accessing the wall from Cooper’s Row – see this streetview link: https://www.google.co.uk/maps/@51.5106264,-0.0769365,3a,57.4y,94.75h,90.43t/data=!3m6!1e1!3m4!1svBAYfNzE1psEF1nunXV75Q!2e0!7i13312!8i6656 I expect the planning consent for the hotel required that public access be facilitated. There is a metal information plaque about the wall at Cooper’s Row, and another one in front of the wall itself. You can then walk through a gap in the wall and on the other side is the tiled Museum of London plaque No 3. The Tablet with the Roman Inscription begs further enquiry. In 1935 the London Passenger Transport Board unearthed the bottom half from workings for its new Tower Hill substation and state that they presented BOTH artefacts to the BM, but it is not at all clear where the top part (found in 1852) had been in the interim. They stated in 1936 that they had commissioned a ‘replica’ of these objects for display locally and a picture was taken that year that in all material respects appears the same as your father’s 1947 image. I would be interested in knowing exactly where this plaque was located. What is there today is yet another replica (in lower garden near the 1967 station) unfortunately lacking the two explanatory metal tablets, it seems. It begs question as to where 1936 replica went. 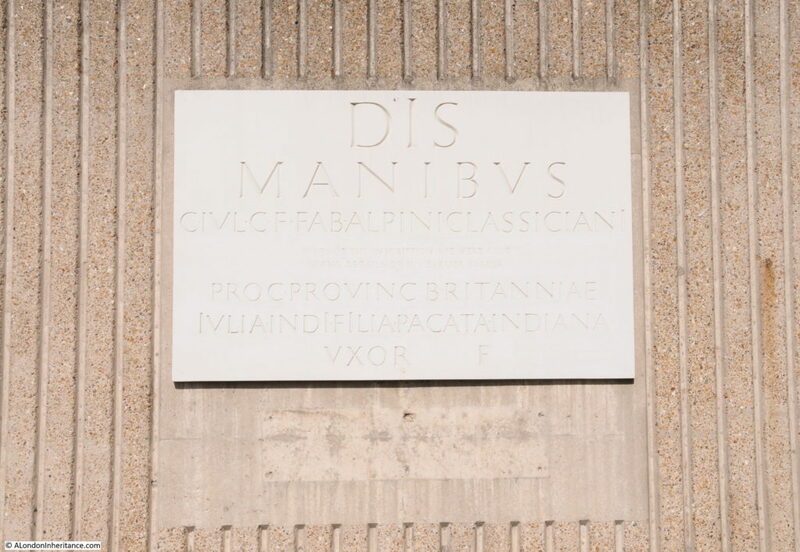 Further to above (and following a visit) the 1936 ‘replica’ Roman plaque (photographed by your father) is still in situ at rear of London Transport substation and one of the explanatory bronze tablets is still there too. It is about 4ft high, perhaps a tad more. The western edge of substation is follows line of and is erected above the Roman wall. Quite separately there is a new, smaller, metal version of the plaque in north wall of the little garden besides the south end of the wall and this includes an explanation that there is a section missing. You can also see a small portion of the wall from the westbound platform at Tower Hill station, through a little hole provided for the purpose.